Last month I introduced the Google spreadsheet where I’ve been tracking my earnings. Here’s another chart showing the income distribution for September. It’s actually very similar to August. 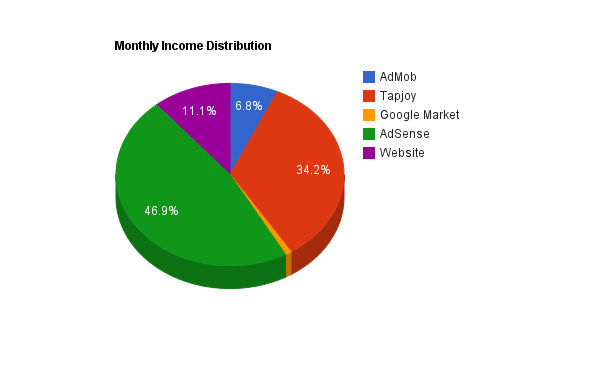 Nothing much has changed here – the majority of my income still comes from AdSense and Tapjoy combined. AdMob comes in at third place, along with other website advertising, and my only paid app on the Android Market continues to perform poorly. At the end of August, I thought this app was pretty much finished. Now that Google+ is open to everyone, there’s really no reason to use this app any more. I’ve put a notice up on the new Android Market listing, that people should see before downloading. However, I can’t make any changes to the previous (suspended) listing on the Android Market. There’s no way I can communicate with the 1,000 people who still have the app installed. It seems quite a number of them have been actively using the app still, generating a decent amount of revenue throughout this month. About 50 people opened the Tapjoy interface every day, and 5 of them would complete an offer on any given day. Of course, I’m not complaining about the continued revenue! 😉 Just curious to see so much activity on an app that’s been rendered defunct. The active installs are slowly dropping off – which seems to indicate the Android Developer Console does update stats for suspended apps. It’ll be interesting to see how long this app continues to hang around for. This month saw a slight increase in AdMob revenues, which was encouraging 🙂 Most of the revenue came from Google+ Invites and Tap That! Number. My Revenue Monitor for Tapjoy and Simple Quotes app didn’t really pull in much at all. This was another productive month for website advertising, with Google AdSense bringing in the most revenue. I also got a smaller income from selling direct advertising on the website. 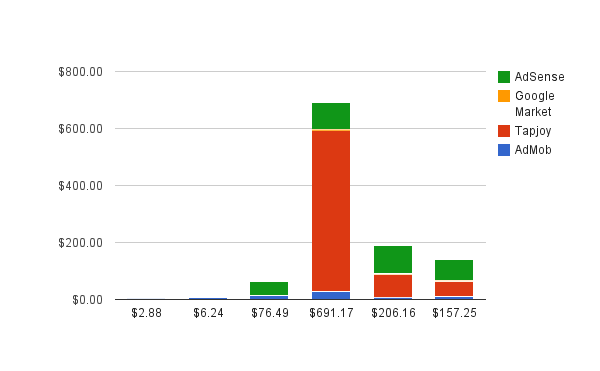 Overall, the work I put into the website continued to pay off, with about $90 total revenue for the month. To put that in perspective, it’s enough to pay for domain registration and hosting for the entire year. The big spike on September 5th was when my story about Google+ Invites hit the front page of Hacker News. Overall revenue is down again, but not by so much as last month. Considering that I didn’t release any apps this month, I’m quite happy to see AdMob holding steady. Tapjoy was also surprisingly effective, thanks again to Google+ Invites. The only thing I’m disappointed about is that my website advertising is consistently out-performing the Android advertising. I do put a lot of time into writing (hopefully!) high quality blog posts, so it’s good to see that investment is getting some return. But it would be nice to get some more substantial figures from the apps themselves. Although I can’t really complain this month, since I didn’t release any updates (or new apps). So this is something I’ll be focussing on in the coming months – ramping up some of my apps for increased revenue. I’ll be trying out some more mobile advertising networks, and looking to increase the overall download figures to get more impressions.